“A smart, savvy, experienced negotiator and educator, with demonstrated expertise in HR, Labor and Employment law. I would not hesitate to rely on Debra to break down the most complex and sensitive situations and find effective and efficient solutions. I highly recommend Debra Osofsky, JD for her skills as a contract negotiator and trainer for negotiations on workplace issues. Her deep understanding of the process of negotiations, the implications of each approach and consequences that result are invaluable. Debra Osofsky served as the Executive Director of the AAUP representing UMDNJ faculty and subsequently as special council for the Rutgers RBHS AAUP council. Clearly, our strong interest to recruit her back to our unit shows our appreciation and respect for her skills and understanding. She led us through hostile territory with a calm firm hand. In addition to leading a group representing eight distinct schools within the University, Debra was at the forefront in developing new policies aimed at providing a lasting protocol for salary equity and compression issues. She also assumed leadership in issues relating to appointments and promotions, which create the foundations of workplace environment. Most importantly, her integrity brings forth the respect of all those sitting at the table. You trust her suggestions and the path she is pointing the negotiations. I look forward to working with her again in the future. I provide this recommendation for Debra Osofsky, JD, who is an outstanding teacher and an excellent trainer. 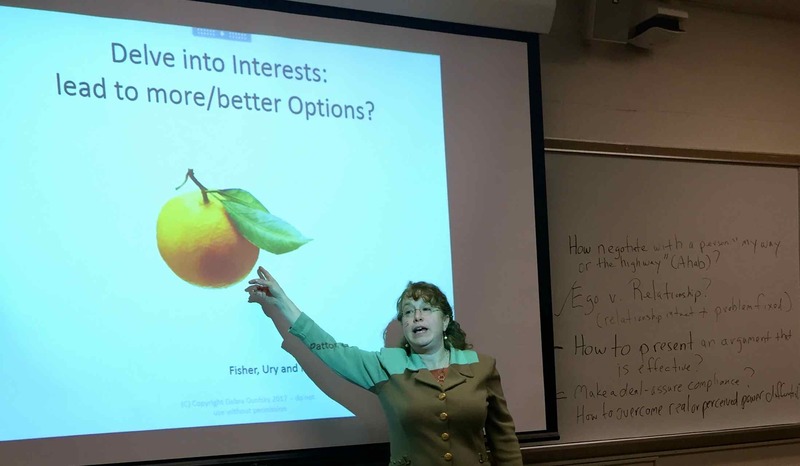 In the Spring of 2012, Debra and I co-taught a combined graduate and undergraduate course in Negotiations at Rutgers’ School of Management and Labor Relations with a course enrollment of approximately 60 students. The course provided a blend of readings that combined analysis with detailed examples and applications. Every three-hour class meeting required students to participate in either negotiation simulations or exercises that were an essential part of the learning experience. Debra provided students with an excellent training in Interest Based Bargaining combined with her insights with many years of experience. In the Fall of 2012, Debra taught her version of the class, which was positively received and reviewed. In my judgment, I strongly recommend Debra Osofsky and would gladly work with her again. “In my former roles as President of the Newark Chapter of the AAUP (American Association of University Professors) , President of the Council of Chapters, and Chief Negotiator for RBHS-AAUP it has been my pleasure to work closely with Debra Osofsky for a period spanning nearly a decade. During my period of involvement with AAUP, Debra served variously as our Executive Director and later as Special Counsel. Her years at AAUP were especially challenging and tumultuous as AAUP attempted to negotiate a contract first with UMDNJ (The University of Medicine and Dentistry of New Jersey) and then Rutgers University and Rowan University as portions of our bargaining unit were merged with those two universities. Debra displayed both extraordinary skills as an Executive Director and as a negotiator during this particularly difficult period. She managed an organization that incorporated representatives from eight schools and colleges representing a diverse range of professionals from physicians and dentists to librarians and spanning the entire State of New Jersey. She managed our negotiations with three separate University Administrations and representatives if the State. She trained faculty and staff in the art and science of negotiations and served as my right hand and chief counsel as we attempted to settle our contracts. In each of her roles with AAUP Debra displayed incredible skill, patience, and insight. She provided extraordinary leadership during a period that had no historical precedence. She displayed unmatched flexibility and dedication to the organization in meeting the needs and demands the appeared to be infinitely expanding and unpredictable.